Screen grab from the ICNA-MAS website for the 2015 ICNA convention. Photo credit: ICNA-MAS website. Every memorial weekend the ICNA-MAS Convention attracts a staggering crowd of 20,000 attendees who are eager to learn from a plethora of international scholars, get involved with important causes in the Muslim community and, of course, shop till they drop in the renowned bazaar. The story and struggle of the bazaar vendors, who bring life to the event and serve as its financial backbone, often goes unheard of however. 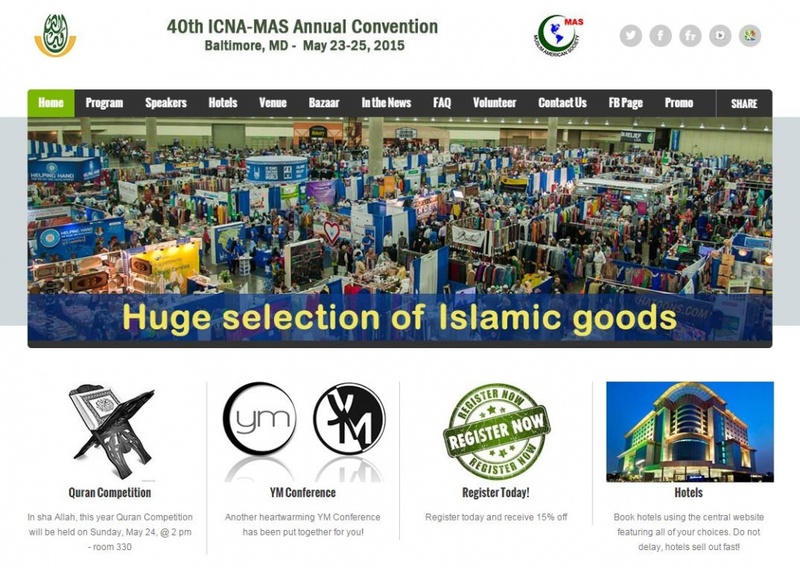 This year the 40th ICNA-MAS Annual Convention, held in the Baltimore Convention Center in Baltimore, Maryland from May 23-24, 2015, will proudly host 842 booths from all over the country. Fifty-five percent of nearby hotels will be sold out nearly 4 months ahead of time. The trouble for vendors begins with registration. A few days before registration officially opens online, vendors are emailed a layout of the bazaar to decide which booth they would like to purchase and informed of vending terms and conditions. Each booth is a small 10’ x 10’ in size and comes with a single table and two chairs. Prices are really expensive, but given the large amount of attendees that come and high cost of operating the convention, both booth size and prices make fair enough sense. 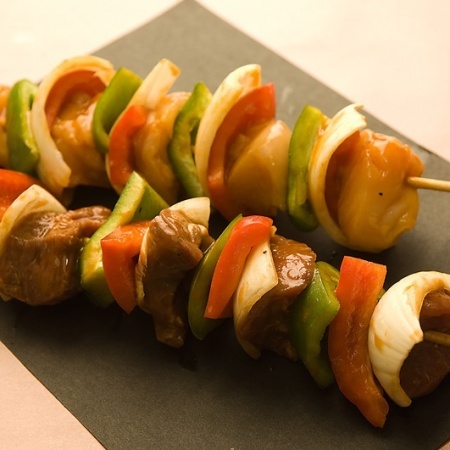 The second that registration starts, however, is when difficulty for the vendors reaches another level altogether. This year, many vendors are complaining about the registration website crashing repeatedly and not having their payments processed properly. Since each second is precious during these moments, the little time wasted because of these issues have big consequences, such as losing a spot or not having a spot. Officials say they try their best every year to accommodate for the hundreds of registrants and test out the registration system before releasing it to the public but complications are inevitable. “It’s like having hundreds of people exit through one, small door. Getting everything organized is very difficult,” says board member Hamid Siddiqui. People working at ICNA are normally working on a volunteer basis, which makes it more tasking to have everything operate smoothly. In any case, longtime vendors state this year has been the worst and most stressful experience they have had securing their booths because of rampant technical issues and the exorbitant amount of people registering. This difficulty is just the beginning. After booking their booths and hotel rooms, vendors spend weeks packing their merchandise, planning marketing strategies, determining their layout and taking care of other logistics. As the event nears, they usually arrive a day early from the convention date to unload their merchandise. “The loading dock time is usually pretty hectic. We travel for hours in multiple vehicles to finally get there, hundreds of vendors are restless and dying to get inside, we wait in line for a long time and hope volunteers are there to help us unload heavy material” says Madiha Irfan, manager at Nu Look Salon & Boutique and 6-year ICNA-MAS Convention vendor. Once unloading is out of the way, vendors spend up to 12-hours setting up their booths. When the bazaar opens the next day, the hours normally run as follows: Saturday, 11:30 AM – 11:00 PM; Sunday, 10:00 AM – 11:00 PM; Monday, 10:00 AM – 3:00 PM. “We are on our feet for over 12-hours at a time, working extremely hard. We have to get there before and leave after the people. What I love about ICNA is that it’s a great Muslim gathering and Muslim businesses are able to get a lot of exposure. But, the people are very rude, unreasonable and unappreciative. Their behavior is un-Islamic,” expresses Omar. The irony of the convention is something to marvel at. In this large, wonderful, bustling Islamic gathering where people are taught to emulate the lovingness of the Prophet (peace be upon him), the all-too-common belligerent behavior of many people in the bazaar is anything but prophetic. For years, vendors across the board have complained about the outrageous bargaining habits of shoppers. The expense of being a vendor is much more costly than people realize. Vendors have to factor in costs for merchandise, booths, taxes, any extra tables, chairs or clothing racks, parking for their multiple vehicles, hotel, food and any additional overhead. When all components are put together, it can be enormously difficult to accumulate profit. Perhaps having a session on Islamic business transaction and consumer etiquette during the annual ICNA-MAS Conventions can help to alleviate this burgeoning problem. Vendors are even rumored to be setting up a union to protect themselves because they are fed up with the way they are treated. Regardless, it does not take much to understand the high cost of being a Muslim vendor financially, physically and emotionally.